IPC’s old weekly Battle Comic—which featured the awesome Charley’s War—was probably an influence here in my version of Star Wars. Unlike DC Thompson’s gung-ho Warlord Comic precursor, which I grew up on, Battle tended not to pull punches – and had a real social conscience. In the strip Johnny Red, a Russian officer at Stalingrad would summarily execute any soldier deserting his post. Charley’s War—about WWI British troops on the frontline featured similarly brutal officers and punishments. My grandfather served in WWI in fact. Today’s strip—without meaning to boast—seems to give a bit more depth than the film does to the actual human experience of warfare. The rebel on the right might actually be tempted to shoot his poor shell-shocked, chest-wounded ally. I can’t remember if this was 1980 or ’82. I’ll have to guess for the moment. It’s yet another page that would have benefited hugely from full use of a simple ruler—or even the edge of a book! I seemed to have enjoyed ruling the laser beams – but just couldn’t be arsed with the rest. It’s a terrible thing that: being the best at drawing in every school – and I was in lots – and being told so, so often that you don’t even bother to use a ruler, basic light pencil construction lines or worry over the proportions of your figures. A case of overconfidence (even arrogance) leading to a slap-dash approach. I’m sure I enjoyed drawing these gashes! A low view at the eye-level of the wounded, fleeing rebel in panel one. And you can’t even see the enemy (much), just the consequences of their attack. An added touch that I like is the laser beams tearing gashes in the metal floor. 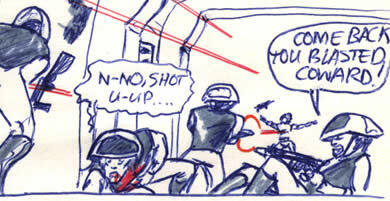 And funnily enough, the best bit is possibly the rebel in panel 2 being knocked back by a shot to the head. Badly drawn but effective I think. How nice to be a middle-class person in Ireland discussing this stuff without any warfare happening around me? No guerrilla troops hacking off children’s arms; no snipers overlooking my town and picking civilians off; no bordering state bombing me and my neighbours. Makes you think doesn’t it? The rebel soldiers are fighting and dying in the Tantive IV corridor. However, one of them is trying to crawl away—holding a blood-soaked chest wound. One of his wounded comrades shouts at him, "Come back you blasted coward!" 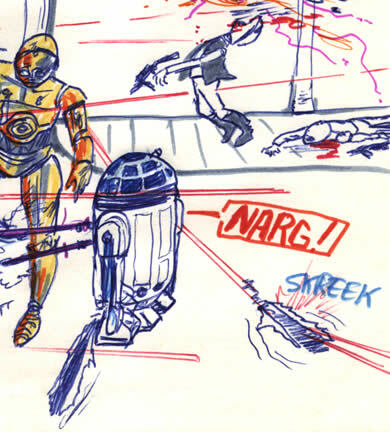 C-3PO and R2-D2 are in the side corridor whilst rebels die in the main one. Lasers fire all around tearing holes and gashes in the walls and floor. "Hurry up you clot!" chides Threepio, ungratefully. That rebel in the second panel got his brains blown out. Can I ask what is with all the blood ? Well you see Sam – that’s just it. Disgusting and unecessary isn’t it? One thing about this page though, is that it seems to have a bit more of a conscience regarding war and violence; possibly because I was older and reading more mature comics. The previous page – done when I was 9 or 10 – just looks gratuitous. Nothing else. I suppose ‘boys will be boys’. Is there any way to add this site as a bookmark so it will load up the newest page whenever I go to it ? if i add it it seems to go the the page where i added it. Hi Sam, I’m afraid not. Best thing is to bookmark the homepage – then you can watch-out for the latest pages (Mon, Wed, Fri). You can also click the RSS feed button top of homepage and you’ll get all the site update notifications that way. You can have the RSS feed display on your Google homepage (igoogle) or via whatever RSS reader you choose to use. There’s also the Facebook and Twitter buttons up there – you’ll get links to all the latest stuff that way too. So that’s where you got the tri-colored rebel lasers! You took the book description literally as three-colors from one blaster! LOL. This reminds me of my own misconception and misinterpretati ons growing up. I can’t think of any right now, but that’s for the best. Love the fact you have a rebel officer shooting a deserter. Very unexpected realism. Was that in the book by any chance? I guess I’ll have to force myself to re-read the first chapter. I’d answer your question Rod… but, I’d only spoil it for you! Hi John White. You come highly recommended by the folks at “Blue MIlk Special”. Infact the hype is so much, it must be kinda like following a dog act. I Like your comic, especially how your take on it now gives it new perspective. I’m just jealous that I’m 38 and still could not draw like you did at age 9. Oh Well. I tried to submit a comment earlier from work, but the computer locked up, so sorry if this makes 2. P.S. Will we ever get to see Boba Fett, or didn’t you make it to Empire? Welcome to the peculiar universe of SW9 Mr.Gatto! Thanks for the kind words. I’m glad that it gives a new perspective. If it was a brilliantly done and merely accurate, faithful re-representati on it’d be of little interest I suppose. Only got this 1 comment – no worries. 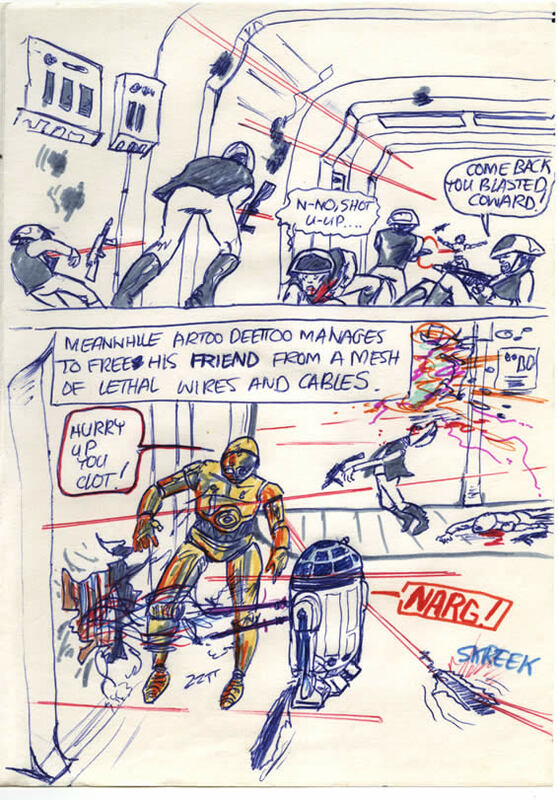 Don’t feel bad about your drawing, some of it – like this page was probably done when I was 12 or 13! Boba Fett? Well, I did adapt some of ‘Empire’ but I don’t think I reached his appearance.